For some signal detection tasks, the program may require a very accurate time. There are some time references in the longwave part of the radio spectrum, which you may receive and decode with Spectrum Lab. Even more accurate timing than with a longwave time signal is possible with a GPS receiver with sync output ('PPS'). Thus, the time signal decoder described in this document has become slightly outdated. To decode the time signal transmitted by one of these stations, tune your radio to its frequency (switch the receiver to CW mode) and listen to the audio (audio frequency should be 650 to 800 Hz). If you hear a carrier which is interrupted every second by a shorter or longer gap, connect the receiver to the soundcard. Check the audio level with SpecLab's oscilloscope if required. Alternatively, if your soundcard runs at 192 kSamples/second, you can connect an antenna directly to the soundcard's input (without a receiver), and in this case set 'f_center' on the 'Config' tab to 60000 or 77500 Hz. Next, start the Time Signal Decoder by opening it's control window (from SpecLab's main menu (View/Windows..Time Signal Decoder). A window like the one shown above should appear. Wait for at least two minutes until you get a valid display of the decoded time and date. The decoder should then display which of the transmitters is being received (DCF or MSF). No need to select the transmitter manually. forces the decoder to start a completely new decoding cycle (useful after you changed your receiver's frequency !). allows you to set your PC's clock accurately to the decoded time (only use this after you verified that the signal is ok!). This feature didn't work on Windows 7 without running SL 'as administrator'. 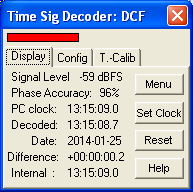 are the current values from the time signal decoder. Note that the hour may differ from your local time zone. is the current time from the PC's internal clock. It is shown here so you can verify proper decoding. is the difference between your PC clock and the decoded time signal. After clicking Set Clock; it should show a constantly low value (less than 100 milliseconds). Returns the last decoded date and time in Unix format (seconds since 1970-01-01 00:00:00 UTC). Takes the 'age' of the decode into account, thus there is a fractional part (from 0 to 0.999 seconds).